Jesus is in trouble again for healing on the Sabbath. Here he heals a paralyzed man – but probably not the same man as in Mark 2, Matt 9 and Luke 5. (The details are pretty far apart. 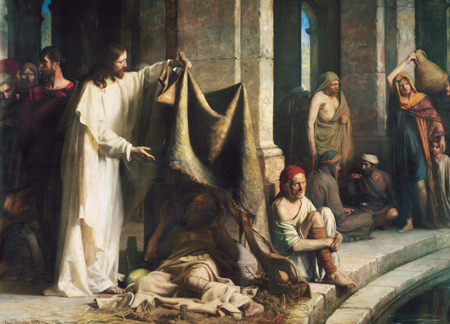 Notably this takes place at the Pool of Bethesda in Jerusalem). I find the story troubling. First, the second half of v 3 and all of v 4 (“waiting for a certain movement of the water, for an angel of the Lord came from time to time and stirred up the water. And the first person to step in after the water was stirred was healed of whatever disease he had”) are not part of original manuscripts and were added in later by scribes. It’s obvious why they were added – because without them the story makes no sense. But is it acceptable to just add whatever is needed to make the story make sense???? Second, as indicated in the first half of v 3, crowds of sick people congregated at the pool hoping to be healed. And Jesus singles out one man to heal in a dramatic fashion (i.e. a carny trick). What about the rest? Why doesn’t he heal them? Third, in v 14 Jesus admonishes the man to stop sinning or something worse may happen – indicating that he believes that misfortune and physical illness results from sin. Not impressive at all. The rest of the chapter is quite the speech! 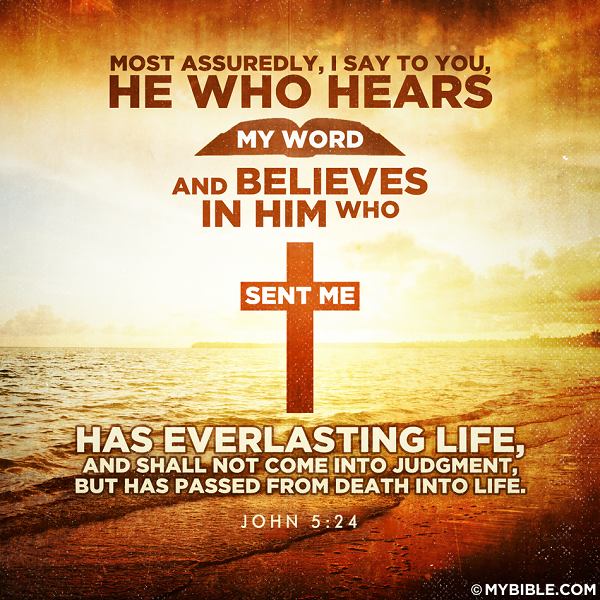 Jesus spells it out – he is the Son of God! So there! The Jews are just harassing him! He can give life to anyone he wants! (v 21). God doesn’t judge anyone (seriously??) – he has passed that privilege on to his son, Jesus (v 22). And those who accept Jesus’ message will never be condemned for their sins; they are guaranteed eternal life (v 24). V 14, referring to OT prophesy (Deut 18:15-18 and Malachi 4:5-6). And then Jesus rejecting the people’s call for him to be their king. WTF? Back to my apologist website – and now it all makes sense. The ‘feeding the 5000’ miracle was an imitation of the manna in the desert miracle back in the time of Moses. Why didn’t I see that before? So obvious! The people expected a Messiah so naturally they expected him to be like, or at least reminiscent of, Moses. Conveniently, Jesus feeds a crowd in the middle of nowhere. And then when they are impressed by the miracle and call on him to become their king, he’s pissed. King is a political title; he doesn’t want to become their earthly king, he wants to become their heavenly king. Next up John offers an abbreviated account of Jesus walking on water. 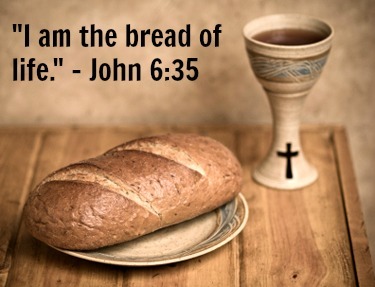 Then he gets into a whole speech (v 22-59) about being the bread of life, complete with allusions to the manna in the desert connection. Aha! I get it now. There are quite a few contributions to the vocabulary and idioms of Christianese in here – bread of heaven; I am the bread of life; Whoever believes in me shall never thirst; No man can come to me, except the Father which hath sent me draw him, and I will raise him up at the last day; anyone who believes has eternal life; who eats the bread from heaven, however, will never die. There’s also the obligatory reference to OT prophesy in v 45 (Isaiah 54:13), although that’s quite a stretch. And then we get to the grand finale – v 51-57. Note that much of this belongs in the conversation at the Last Supper as recounted in the previous gospels. But John doesn’t really have a ‘Last Supper’ in his gospel. Weird, don’t you think? Wasn’t that one of the most important events? And if anyone living in a civilized society today proclaimed publicly what Jesus claims here, they would be apprehended under the mental health act for a psychiatric evaluation. Unless of course they were advertising a horror novel or movie script. Creeps me right out. This guy is one sick puppy. Jesus continues his little pep talk which includes this in v 63: “It is the spirit that quickeneth; the flesh profiteth nothing” (KJV) – interpreted as “The Spirit alone gives eternal life. Human effort accomplishes nothing.” (NLT) or “The Spirit gives life; the flesh counts for nothing” (NIV). Personally, I find the statement insulting and demeaning (as well as erroneous) regardless of which translation is closer to the original intent. They all dismiss human life and action as worthless. The next verse (64) is no better – it implies a set-up and lack of free will – Jesus/God is playing puppet-master here just as in the OT. No wonder many of Jesus’ followers deserted. I’m becoming more disgusted by this gospel with each chapter.